Covered an astronaut today at the Astronaut Ellison S. Onizuka Space Center today. One of the educators brought by a space suit so I took a shot and you can see me in the gold visor reflection. From what I’ve read Neil Armstrong performed one of the biggest NASA P.R. blunders in history. He never handed the still camera to ‘Buzz’ Aldrin when they were on the moon with Apollo 11. So there were no still photographs of Neil Armstrong on the moon taken. The first guy to set foot on the moon and nobody shot his photo while he was there! So when LIFE magazine wanted a photo of Neil Armstrong on the moon for the cover of their magazine they had to use a photo similar to this one. 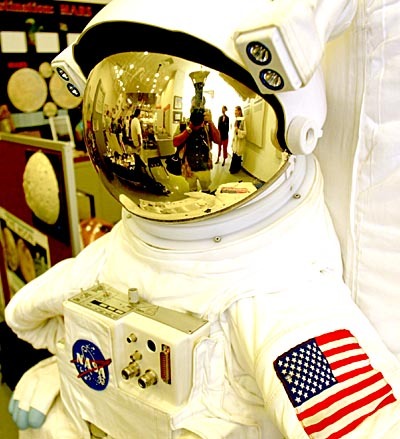 A photo of ‘Buzz’ Aldrin but with Neil Armstrong reflected in the visor. 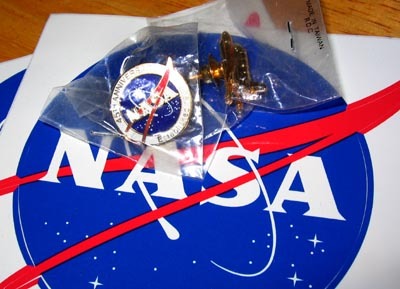 One of the NASA guys were passing out goodies to everyone who showed-up, some NASA stickers and a couple of pins. One pin is the 45th anniversary pin for NASA, the other is a little gold space shuttle. The NASA event was a commemoration of the 19th anniversary of the space shuttle Challenger disaster. I remember that day. I woke-up very early in the morning, maybe about 3:30a.m. or 4a.m., I was tossing and turning and couldn’t get back to sleep and felt something was wrong. So I turned-on my TV set and saw them replaying the shuttle explosion that had happened withing the past few hours. Shocking. I was on Oahu and called someone on the Big Island, I woke him up. He was very sleepy and asked me what was up. I’ve heard older folks talk about where they were and what they were doing when they heard president Kennedy was shot. The three events that stick out in my mind where I could pinpoint where I was and what I was doing are: Elvis dying, Ronald Regan being shot and the space shuttle Challenger disaster. How about you? Next PostNext Do you feel lucky? Punk?